Guy’s Cliffe in Warwickshire dates back from 1751 and is said to be one of the Most Haunted locations in the UK. An imposing long forgotten building, stood lost in time, this building holds within its walls a plethora of ghostly activity just waiting for you to investigate! This formidable looking building has a grade II listed status and is said to be Warwickshire’s hidden gem. It derives its name from the legendary Guy of Warwick whose large statue can be seen inside the remaining Chapel which was founded in 1423. The Chapel of St Mary Magdalene is still used for Masonic Ceremonies today and is thought to have once attracted Hermits and Solitary Men who lived and sheltered in the natural caves that still remain at this site today. During the First World War Guys Cliffe House became a hospital and over 600 wounded soldiers passed through the archway to recuperate. Guys Ciffe House was sold in 1947 with the intention of converting it into a hotel, but these plans came to nothing and the house fell into disrepair. In 1955 the house was purchased by Aldwyn Porter and the chapel leased to the Freemasons. In 1992 The Adventures of Sherlock Holmes was filmed on location here, a fire scene got out of control which sadly left the building in the ruined state it can be found in today. There is a vast amount of Ghostly phenomena that has been witnessed at this location such as strange smells, footsteps and apparitions along with eerie voices which are often heard in the Wine Cellar of Guy’s Cliffe, recent recordings have been captured on EVP with the distressed voice of a young Girl asking over and over ‘Help Me’ The Butlers Parlour in particular is also an area of ghostly activity with heavy doors slamming shut of their own accord and loud heavy breathing sounds have been heard in the under passage along with knocks to questions asked and stones thrown at those daring enough to ask for a response from any residing spirits. A great deal of visual phenomena has also been reported by visitors here in the Butchery Room, strange round orb-like lights clearly seen by the naked eye along with the terrifying sight of disembodied hands and feet moving along the wall and floor. You will have full use of ghost hunting equipment during the event and take part in vigils and psychic experiments such as Glass Divination,Ouija Boards and Table Tipping plus free time around the location to conduct you own spooky vigils also. 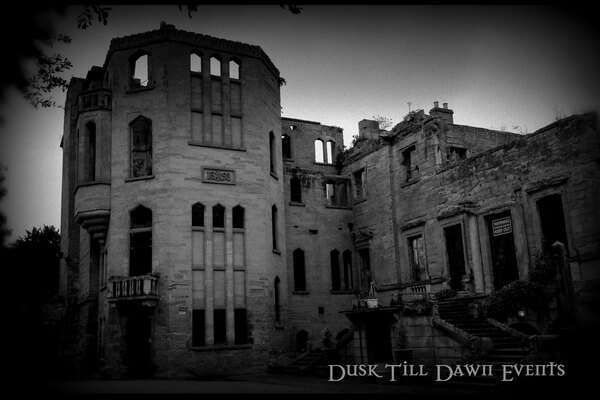 As this building may get cold Dusk Till Dawn Events advise Guests to wear warm clothing. Tea, coffee and biscuits are provided by Dusk Till Dawn Events. Don’t forget to bring along your Camera’s, Camcorders and any other recording equipment you never know you may catch something Paranormal on film! If you choose the non-refundable deposit option, the final payment for this event will be required no later than the 30th September 2019. We accept a non refundable deposit of £15.00 per person for our Ghost Hunting Events that are 5 or more weeks away. *If paying by Deposit please note the final payment for this event will be required no later than the 30th September 2019. There are no sleeping facilities available.